Noctilucent clouds, which form at the edge of space, may be tied to a warming planet. The sky above Antarctica is glowing electric blue and the appearance of the seasonal noctilucent clouds is among the earliest on record. 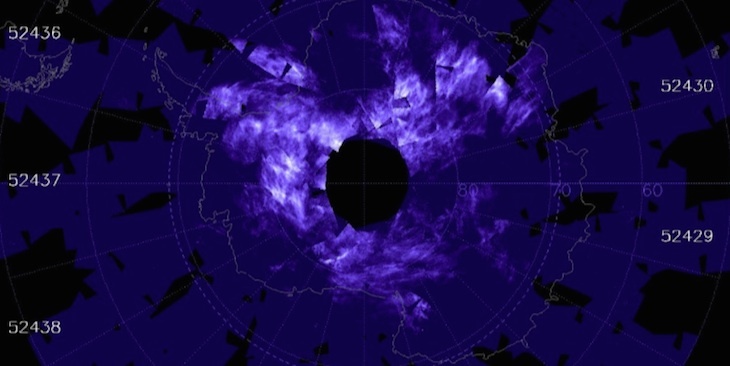 Scientists using NASA's Aeronomy of Ice in the Mesosphere (AIM) satellite report that the discovery of noctilucent clouds over Antarctica on Nov. 17 ties 2013 for the clouds' earliest appearance. A paper published in the March 2016 edition of the Journal of Geophysical Research suggests the clouds are appearing more frequently and are brighter due to climate change, reports Spaceweather.com. "The southern hemisphere polar stratospheric winds switched to their summer-like state quite early this year," said AIM scientist Cora Randall, with the University of Colorado. "The early start of the 2016 season was not at all a surprise." NASA says noctilucent clouds form during the summer due to wind patterns and the flow of atmospheric humidity. More water molecules reach the upper atmosphere during summer, allowing some to mix with bits of meteoroids at the edge of space, which seed the clouds. Summer also is when the temperature of the upper atmosphere is coldest, allowing ice crystals to form. "In recent years nocticulent clouds have intensified and spread. When noctilucent clouds first appeared in the 19th century, you had to travel to polar regions to see them. Since the turn of the century, however, they have been sighted as close to the equator as Colorado and Utah," NASA said in a 2013 press release. One reason this may be happening is due to a greater concentration of the greenhouse gas methane, which becomes oxidized by a complex series of reactions to form water vapor, according to AIM lead scientist James Russell, with Hampton University. The extra water vapor is available to grow ice crystals, which eventually form into noctilucent clouds.